We were so excited to zip down to our local bookstore and pick up Sunday's paper - because look, it's us! (Well, it's our logo, Josephine the printing machine, and Sara...sweeping.) 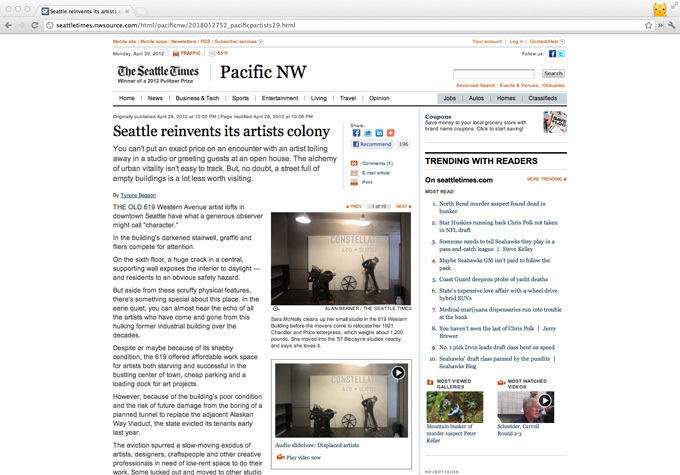 The Seattle Times has been in touch with us and our studio mates since before the big move, and it's great to see the story finally come out. If you missed the ink and newsprint version, you can read the article online here. There are also several more photos and an audio clip here. "Despite or maybe because of its shabby condition, the 619 offered affordable work space for artists both starving and successful in the bustling center of town, cheap parking and a loading dock for art projects." 619 was exactly what we needed when starting our business. For us (and for so many artists), 619 was the only option we could afford starting out. Sure, it scared our friends and family (which everyone admitted after we moved), but it was our little slice of Seattle. It was a foothold that allowed us to grow our business. We scrubbed and painted and decorated and made it ours. It was special. It was a lot of work and a leap of faith to find a new place, make moving arrangements, get things moved, settled, and reestablished. We lost months of client work in the shuffle, which could have been devastating without the help of the DOT. But we did have their help, and they have our gratitude. "(Jane) Richlovsky used her (reestablishment) check to set up shop in a historic building nearby at First Avenue and Cherry Street. She renovated an entire floor's worth of commercial spaces in a project known as the '57 Biscayne artist studios. About a dozen of her former neighbors from 619 Western have since followed. Have I told you lately that Jane is awesome? Our new space in '57 Biscayne is amazing, and she's the one to blame. It's really wonderful to see Jane's hard work and selfless service to our little community shown to city at large. Nothing about the '57 Biscayne project was easy - but Jane tackled each challenge with skill and poise. We are very thankful for her, and for the opportunity to be a part of the community at '57 Biscayne. "In Seattle, artists have to be developers, landlords and mom-and-pop entrepreneurs, marrying a right-brain sense of creative possibility with a left-brain business savvy that's more common in an MBA. "...It might seem nuts to think that an artist, the very definition of unconventional living, may want what bankers, engineers, teachers and corner grocers do, that they might measure their success with benchmarks embraced by the 9-to-5 cubicle crowd. But it's not such a stretch. Serious artists struggle to find a place to work, earn a living from what they do and manage their money like everybody else. In fact, they are small businesspeople, and many, like Richlovsky, believe it's crucial for artists to establish themselves in the same way that other professionals do." This idea of small business in the arts was on our minds a lot when it came time to move. "Where do we fit?" was a question often asked. We didn't want a storefront, were too messy for an office building, and considered "too much of a business" for certain arts buildings. At '57 Biscayne, we fit right in. We're all "small business artists," making a living doing what we love. It's a great place to be. Okay, okay. Time to wrap up. But first, some sappiness: it's really exciting to be in the paper in the city we love. Once upon a time I stared at a glossy poster of the Seattle skyline, hoping for a chance to live here. A picture in the paper may not be a big deal (but come on, i'm a Newsies girl...King of New York, anyone? ), but today I just feel honored to be an artist and business owner here in this city. It's an honor, Seattle. I wouldn't live anywhere else.